The early history of Bear Valley is similar to that of many other gold camps of the Southern Mines. The placers were discovered by Mexican miners in 1850, who took out near $250,000 worth of gold in just a few weeks. It wasn’t long after the arrival of the white miners that the Mexicans were forced out of the camp, made to begin their search for gold anew. A short boom occurred and the camp grew quickly, but within a year’s time the placers had been exhausted and many of the miners left for better diggings. Good fortune returned; however, as several rich quartz mines were discovered and the town experienced a reboom. A miner is reported to have found a lump of pure gold “weighing fully three pounds,” according to the Alta on March 15 of 1854. Several stamp mills were in operation during this time and the noise from these, along with the strange shrieks of the steam engines, proved unsettling enough to drive away any and all bears from the region to which they had given their name. This camp should probably be known as Alias City, as it was known by a number of different monikers during its first decade of life. The original title was Haydensville, after David, Charles and Willard Hayden, whose claim to fame was acquiring part of the Great Johnson Vein in 1850 from its discoverer, John F. “Quartz” Johnson. When the first post office in the county was established here on January 21 of 1851, Haydensville was the name and J. C. Higginbotham was the postmaster. The Haydens soon went bankrupt and the post office was discontinued on August 20 of 1852. During that year the place became known as Biddles Camp, or Biddleville, presumably for a Mr. Biddle. Following this we have Simpsonville, which was bestowed upon the camp in honor of storekeeper Robert Simpson. In 1856 the town was surveyed and renamed Johnsonville for “Quartz” Johnson, the well-known and popular miner. The post office was re-established on June 21 of 1858, at which time the camp was christened Bear Valley, the name it bears today. 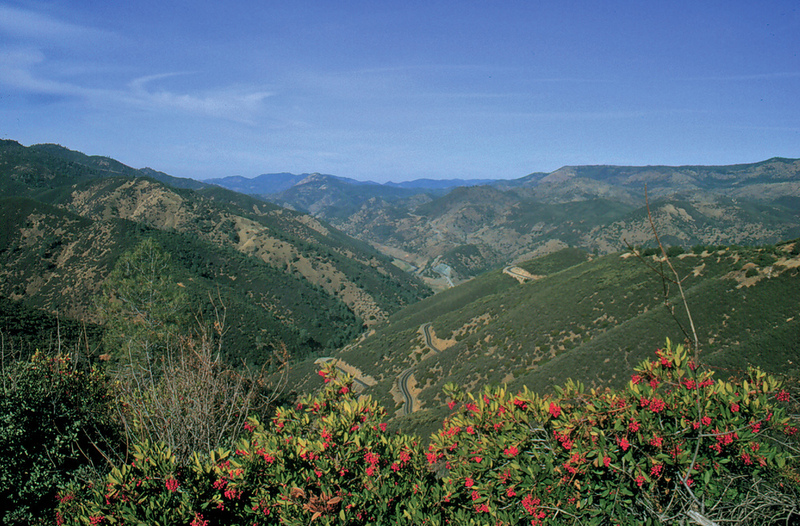 Colonel John Frémont chose Bear Valley for his home and for the headquarters of his mining operations in the vast Mariposa Grant. His holdings came to resemble an old time feudal domain: many of the town’s inhabitants worked for Frémont in his nearby Pine Tree and Josephine mines; travelers stayed in his famous Oso House, a two-storied, balconied hotel built of lumber brought around the Horn; most of the inhabitants purchased their supplies at his large company store and other businesses, which furnished a tidy income. Frémont built a home where he and his family lived in elegance and comfort from 1858 to 1861. It was known as “The White House,” since Jessie had it white washed in remembrance of her husband’s presidential candidacy in 1856. French servants took care of the domestic chores, which also included catering to the needs of visiting dignitaries and distinguished visitors at the frequent and lavish parties hosted by the Frémonts. A large garden provided fruits and vegetables for the area, a Gold Rush rarity. Horace Greeley was a guest at the White House in 1859. He later wrote, “The Colonel is now operating two stamp mills and netting $100,000 a year.” The White House burned in 1866 and was never rebuilt. Bear Valley’s appearance today is quite different from what is was during the Gold Rush. A fire destroyed a large portion of the town in 1888, and as the mining activity had greatly decreased by that time, many of the buildings were not rebuilt. Even so, there are still a number of interesting buildings and ruins remaining in town, making Bear Valley a rewarding stop on any visit to the Gold Country. Bear Valley is located right on Hwy 49. The Bon Ton Saloon building is a restaurant whose forerunner dates back to Frémont's day. Established in 1860 as a saloon, this wood frame structure has seen a lot of use since those early days when many a miner climbed the steps to partake of the liquid hospitality offered inside. A Stone Building in good repair stands next to the Bon Ton. Constructed of stone and adobe, this structure's outside walls were at one time plastered over, with grooves then being etched into the surface in order to give it the appearance of having been built from stone blocks. The building originally housed a general mercantile establishment, but has stood empty now for many years. The Stone Ruins standing right along the highway are quickly disappearing due to the ravages of time. A heavy rain recently led to the collapse of the left side of this old ruin. Back in the days of gold, this building probably housed a general store where miners could procure their supplies and tools, and maybe a pair of boots if they could afford the price..
A Stone Monument near the old ruins relates a brief history of Bear Valley for the casual traveler along this stretch of Hwy 49. The I.O.O.F. Hall served as the meeting place for the Odd Fellows from 1862 to 1950, after which the building housed the Oso Museum for a number of years. The Trabucco Mercantile Building first opened in 1862 and is one of the better preserved structures remaining in Bear Valley. This is probably due to its solid construction and to the fact that it remained in business for many years, and so was kept in a good state of repair. The Stone Jail Ruins which stand on a slight rise above town may have been quite escape-proof at one time; today it would be hard pressed to hold anyone as its roof is gone, along with a large portion of the front wall. The jail was built of schist rock set firmly in mortar and was equipped with a heavy iron ring embedded in the center of its floor, to which the prisoner’s leg irons could be attached if need be. It’s obvious after visiting a few of these old jails that a no-nonsense approach to holding law breakers once prevailed in California. Hells Hollow - A fall into it is death. Hells Hollow, a precipitous ravine which descends some fifteen hundred feet to the bottom of the Merced River canyon, is best viewed from a turnout off Hwy 49 just north of Bear Valley. So called due to the excessive heat and numerous accidents along the rough trail in the early days, Jessie Frémont wrote of it in 1859: “A fall into it is death.” And she was not kidding. The highway clings to steep canyon walls, twisting and turning without any benefit of guardrails, so it’s best to keep your eyes on the road and your hands upon the wheel. The Pine Tree and Josephine Mines are located just a little ways down into Hells Hollow. These rich deposits were located in 1849, shortly after the discovery of lode-gold at the Mariposa Mine. Originally separate, they officially became part of Frémont's Mariposa Grant in 1855 when the U.S. courts confirmed his grant, after which they were worked jointly for many years. During their operation, the mines yielded over $4 million in gold. Today all that remains from those days of gold are tailing, strange rock formations and rubble, ore car tracks, and the various foundations of buildings long since vanished. To carry the ore from the mines down to the mills at the bottom of the canyon, Frémont engineered and financed a unique railway system down the ravine. Constructed with Chinese labor, the gravity operated railroad began operation on August 1st of 1860. The ore-laden cards were controlled (most of the time) with brakes as they descended the canyon, by a man riding on one of the cars. The empty cars were then pulled back up by mules. Part of Hwy 49 was built on the old roadbed of this ore railway.